Never let it be said that I was any kind of trendsetter... I had bangs when nobody wore them... now that I've let my hair grow to all one length... the "Cool People" are wearing BANGS!!! 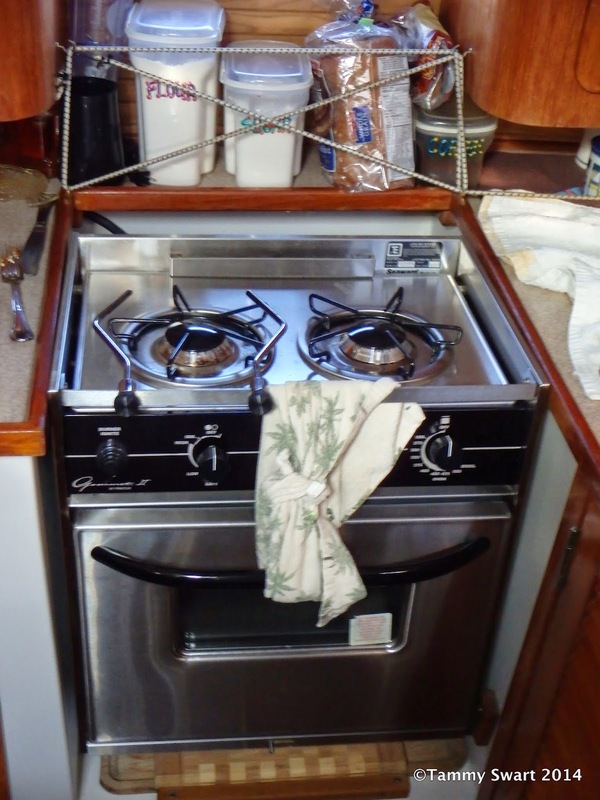 After spending decades aspiring to a bigger house full of more (useless) things... we've thrown it all away and moved onto our 45 ft floating home. It has now come to my attention that there is a new movement afoot... the Tiny House Movement. HA! We're finally on the leading edge of something!!! We were doing something cool... before it was cool! Moving from almost 2,000 sq. ft. onto this small (comparatively speaking) boat, was accomplished in stages. We moved onboard two years ago with our favorite things and household items we thought we would need, and then continued bringing things from the house as we needed them for a while. 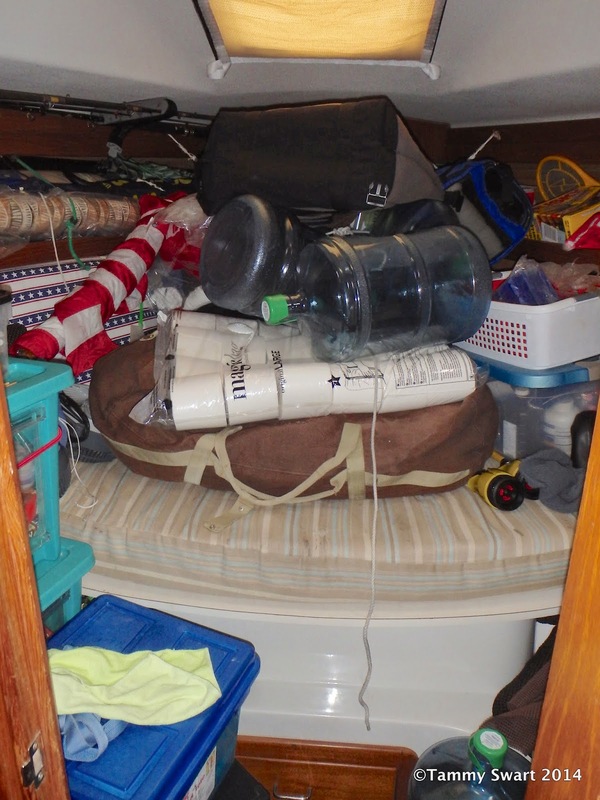 That eventually dwindled to nothing, and then we began to actually take things OFF the boat in the never ending fight against Clutter. 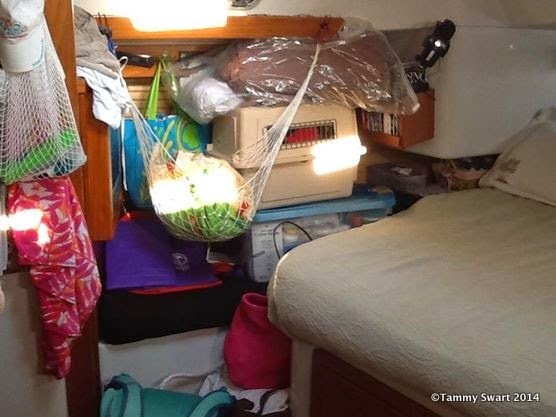 Clutter is a problem in a small space. If a thing had no designated place, it must either find one or GO! Every few weeks, usually spurred by a search for something, we identify things that we forgot we had. Toss! Now if only we could make good on our vow to never experience Winter again... we could offload about half of the the clothes and blankets we carry around and we'd be set! 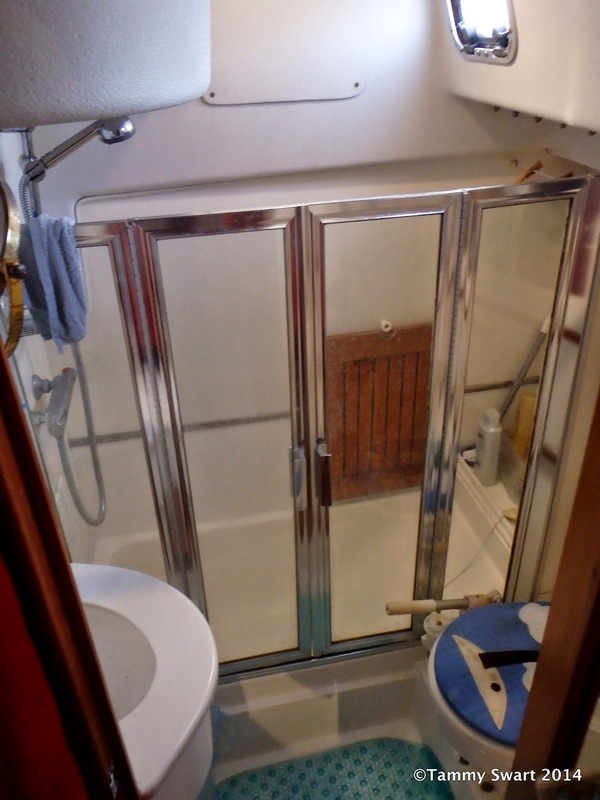 Fortunately for us, we have a lovely garage v-berth that we use to store things used less frequently where they can be out of sight and out of the way until we need them. Unfortunately... those things must be shuffled to temporary homes whenever we have guests aboard. Off the charts on the Clutter Scale! Don't get me wrong... we LOVE having guests! But if you come to visit us, prepare yourself to live as if you're spending the weekend in the bottom of a teenager's closet. Why would we want to leave all of our STUFF and do this? Well, the reasons are different for everyone considering downsizing... but for us, it means that we no longer have to divide our time between caring for a home, and cars (and a job) and doing what makes us happy... SAILING! We can spend our time doing the things that we enjoy doing. We can travel together and see parts of our country (and the world) that so few people ever see. Every day can be different from the last... and all the while, we're snug as bugs in our cozy little home. Now I'll get to the fun part, the part where you get to see how we live. But before I do, I have to say that we are so very lucky to have found this boat. 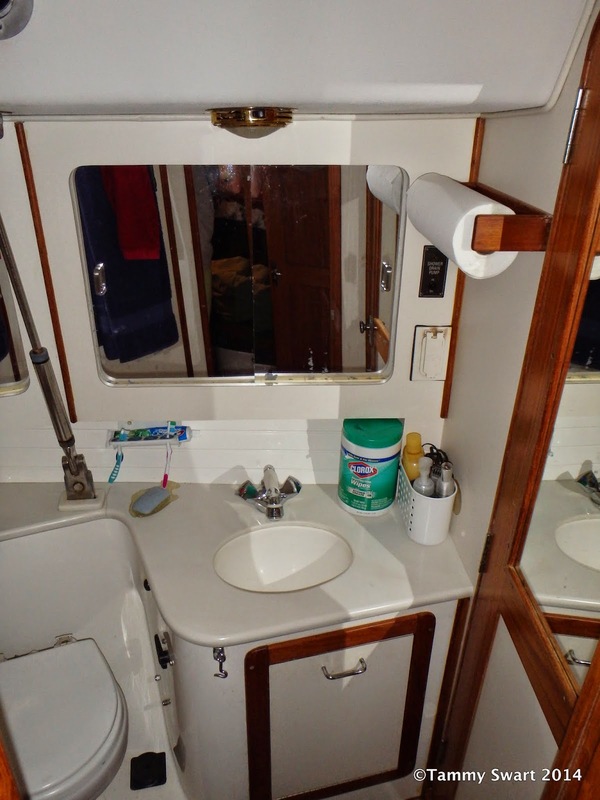 Lots of Cruisers are living happily with so much less than we have. And... there are also those who have far more luxurious floating homes... We have found the perfect niche somewhere in-between... Even "Tiny Houses" can be as individual as the people who live in them. Thats's IT! That's all there is to it. Everything you've seen shows all of our available living space down below. We do spend lots of time in the nice center cockpit with full enclosure to keep out the elements. 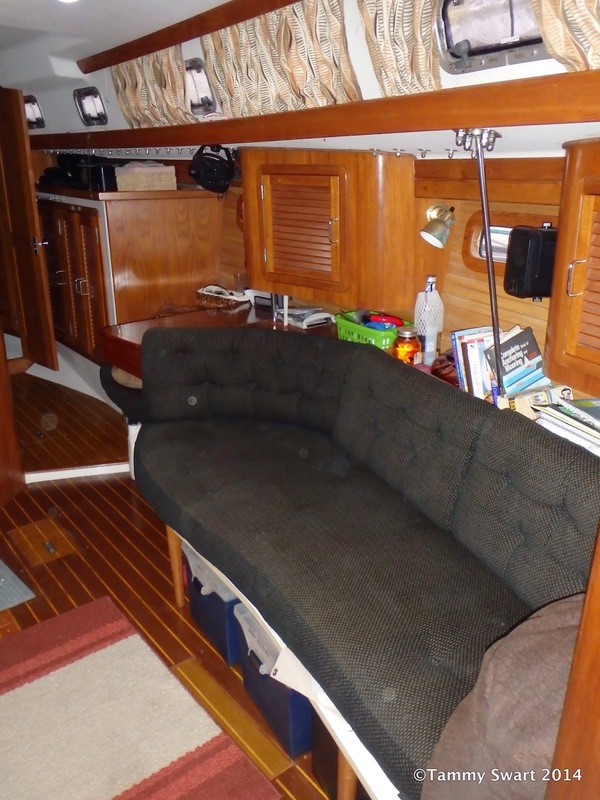 Our boat has a lot of hidden storage space below the floors and inside the built in furniture. Living in a home this tiny, the builders have taken maximum advantage of every possible inch of useable space. Are there things we miss about living in a house? Well sure... Bruce misses having a real garage to store his tools. I miss having a full size bathtub and our cozy reclining leather chairs that we used to watch TV in upstairs... but the tradeoff is that we now get to lounge on the deck and watch nature and the world go by. We love living in our tiny floating home. 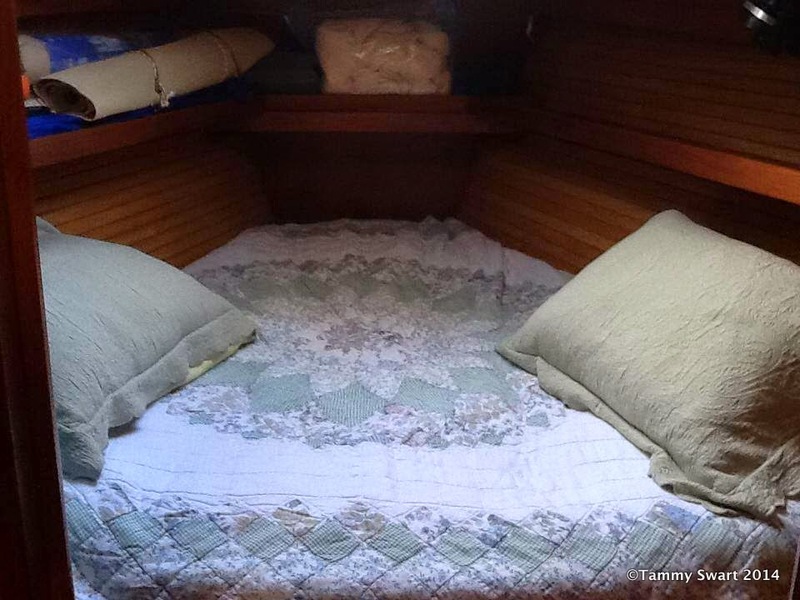 Our friends Jody and Peter (their blog: Where The Coconuts Grow) also live and cruise on their tiny home S/V Mary Christine. 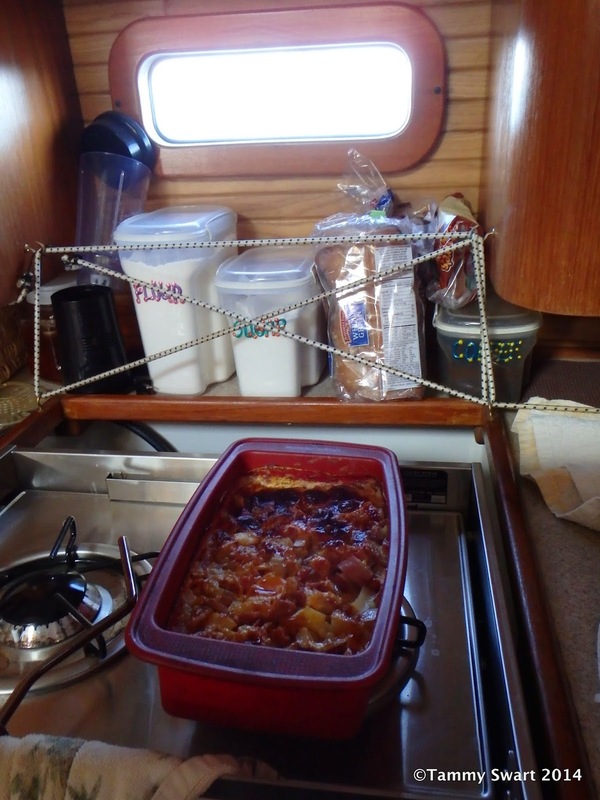 Jody blogs for Tiny House Blogs and has extended a little bloggy love our way in her latest post titled Favorite Things. Read about it HERE. Look familiar? That’s our sister ship, Boom De Yada. We met these Canadians in Beaufort, SC at Ladys Island Marina… and because they have such stellar taste in sailboats, we decided we should buddy boat our way to St. Augustine with them. We were prepped and ready to resume our southbound journey on the day after Thanksgiving as we followed Boom De Yada out through the Ladys Island Bridge at high noon. 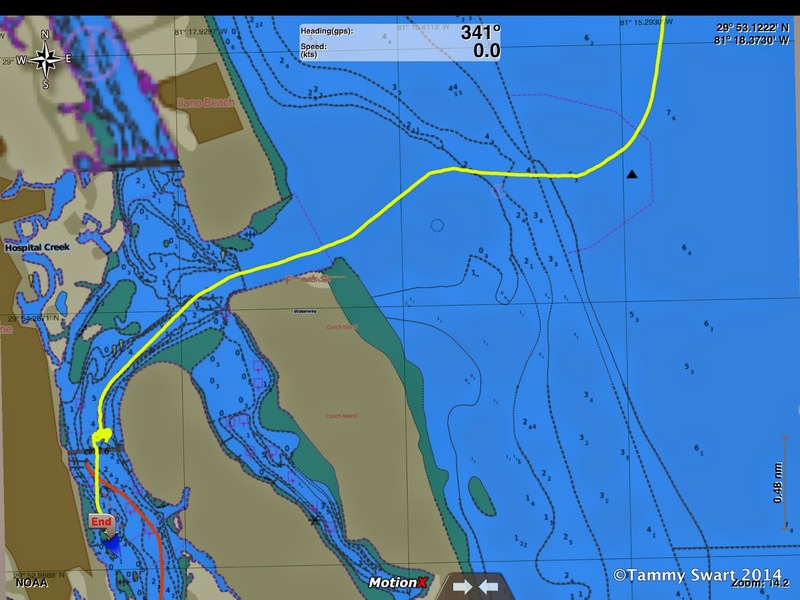 We had some current against us but the tide would turn before we reached Port Royal Sound and headed out to sea. 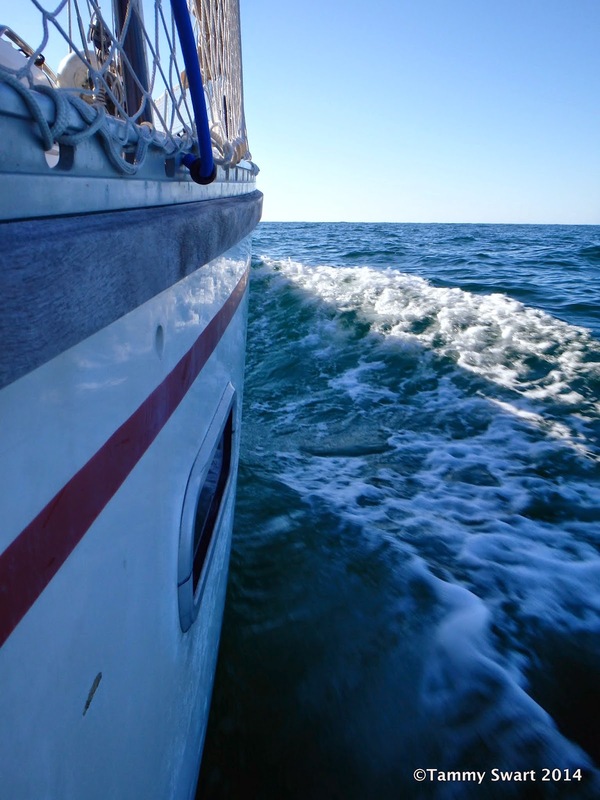 The tide turned and the current began to whisk us along at speeds over 7 knots COG. Swells began to find us as we approached Port Royal Sound and Jezabelle disappeared below. By dark, she had finished her outwardly visible signs of Mal-de-Mer and settled in on top of the engine room for the duration of the passage. Jetsam is our sailor. She joined us in the cockpit many times throughout the trip, even snuggling with me (which is unheard of) for about an hour, sometime during the dark hours. 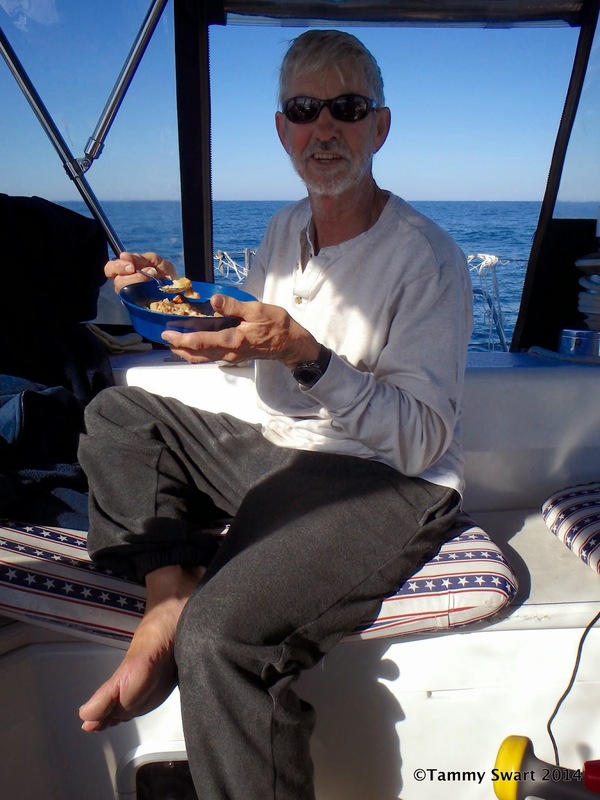 By the time the sun had set, we had reached the Port Royal outer buoy and made our turn towards the south. We followed within about a quarter mile of our buddy boat and wished them a good evening. We had our dinner and started our watch rotation. 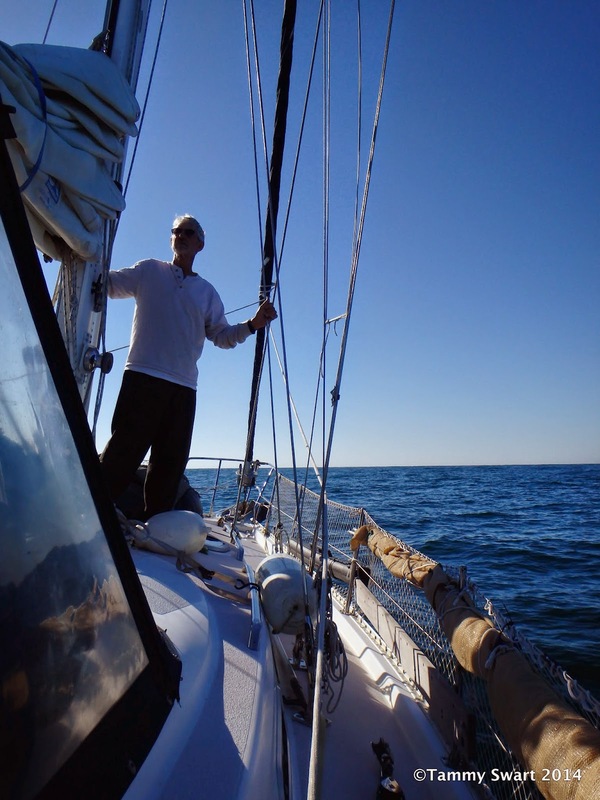 We had light north winds and following seas 2-4 feet off our port aft quarter. Our hopes that the seas would flatten were in vain as we wallowed and rolled all night long. Just after dark, Boom De Yada hailed us to say that their engine had suddenly stopped. WHHHAAAT??? We killed our RPMs and began to circle them in the rolling waves. Their boat was dead in the water. They raised the main to steady the ride but I was feeling pretty badly for them at that moment. Why does this stuff always happen in the DARK??? Bruce took the first watch while I slept in the cockpit. It was pretty chilly inside our enclosure, but not uncomfortably so. I snuggled down with my pillow and got some fitful sleep full of wild images and crazy sounds. Not a good sleep, but still sleep… My first thought when I felt Bruce gently touch my ankle was “what is that bright light in the sky?”. I opened my eyes to a sky brilliant with stars. Oh it was awe inspiring. We were over 20 miles offshore and the lights of the land could not reach us. Bruce went down for his nap while I sat there in the cockpit alone. I nervously kept watch on the gauges and instruments until I gained a bit of comfort. There was nothing out there for us to run into. The moon that had been shining down on us and illuminating a path on the water when I went to sleep had set, but there was still some ambient light from all of those stars. I alternated between stargazing, checking the horizon before us for dark looming hulks, and checking the chart plotter and engine gauges… Those were my duties and I take them seriously. The three hours passed quickly and Bruce awoke to take his next watch. Back to the blanket I went. The next thing I knew, it was nearing sunup. We had made it through those long, dark hours with no mishap. We had heard some calls from our buddy boat during the night, but they couldn’t hear our responses. We hoped they had resolved their problem and were following… but we didn’t know. I stared over the rail as the sun came up over the waves. The swell had moderated somewhat during the night. We had periods of flat water with a couple of big rollers every few minutes or so. With the dawn came exhilaration. The best feeling in the world. So he took a nap. Poor guy. He takes the lion’s share of the overnight hours on watch. He is the best husband ever, and looks so sweet sleeping there in the cockpit. Don’t you just want to give his forehead a little kiss… er, um… never mind. Forget about all that. Don’t kiss him. Back to breakfast. The smells that blew on the wind were soooo good. I wonder if the dolphin are interested in people food. (random) My casserole turned out beautifully. It was warm cheesy goodness and just what our rolly tummies needed. I just can’t tell you how great it feels to be back out there. We’ve spent so many months at the dock, which have been great… but this. THIS is what we’re after. I tried to get a picture of the swells as they loomed behind, lifted us, then gently set us back down again. The picture does nothing. We watched the waves, seeing one crusty looking turtle and some dolphin and birds. Bruce got out and took a look at the rigging. 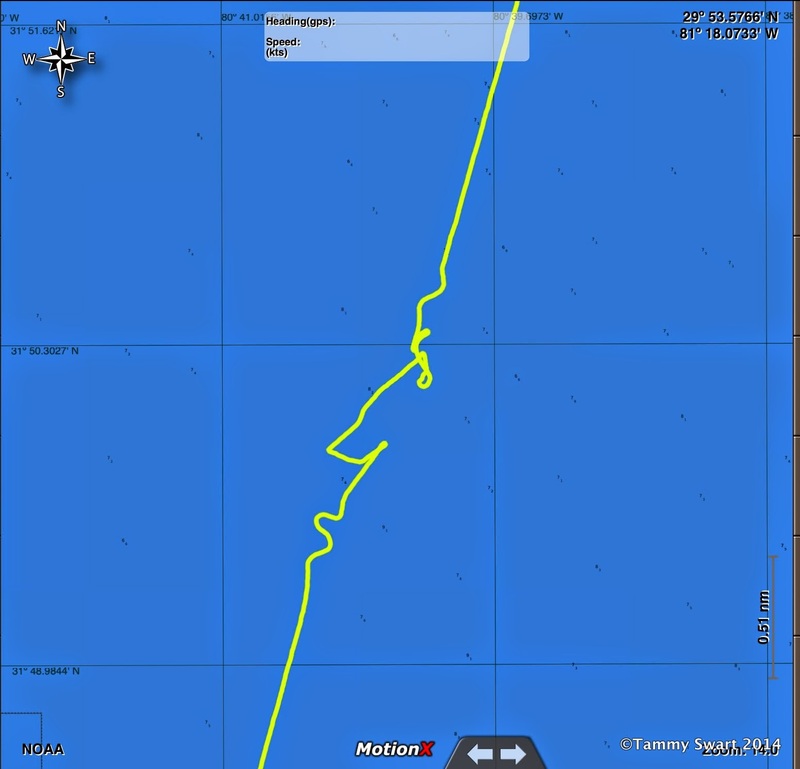 I had questioned if the forestay seemed loose. He checked it out and will need to tighten the backstays a bit. 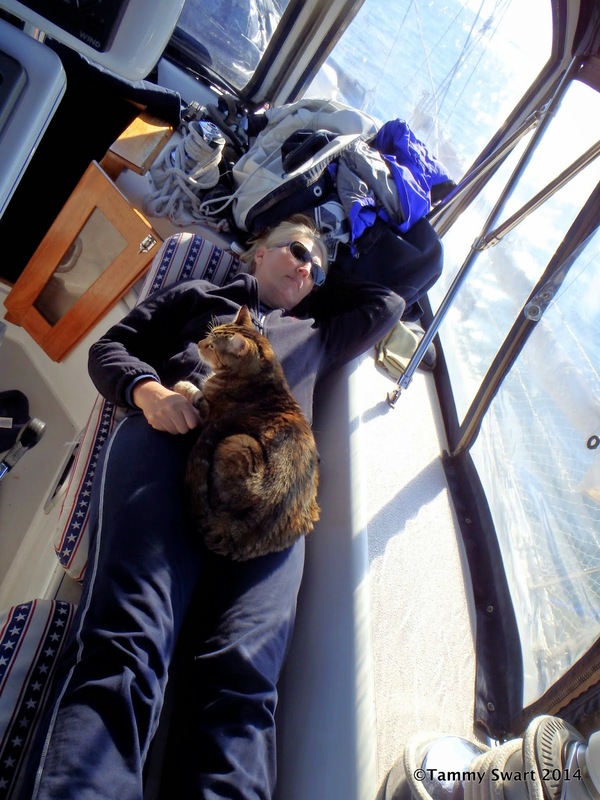 Maybe they hadn’t been completely turned after our forestay was repaired back in Charleston… He spent some time on deck enjoying the sun and the breeze… This is what he lives for! 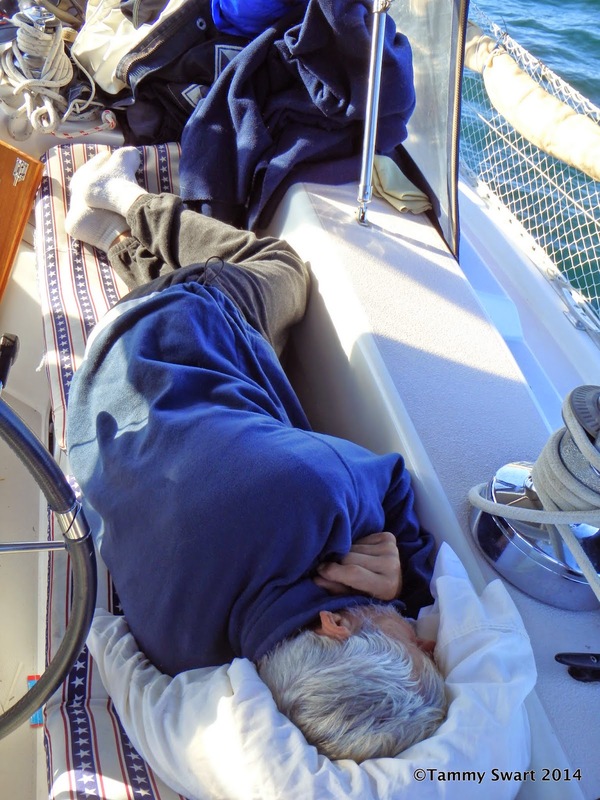 We settled into the cockpit to enjoy the day, wishing that we actually had MORE offshore hours in daylight… when Bruce suddenly began to sputter and point! Look at that! It was a whale breaching!!! Yes, a WHALE! We had been listening all the way to the VHF reports by USCG to be on the lookout for Right whales and their calves. We don’t know one whale from another, not being from whale territory… so we called in our sighting. Later in the morning we got a call from the Whale Watchers lady who wanted more info and to ask some questions. Turns out what we saw was a humpback and not the endangered Right Whale, but it was a WHALE! No pics as it dove and didn’t return to the surface before we continued out of sight… but it was about a boat length off our starboard side and we are SUPER excited about sighting our first actual WHALE! Once we settled down again, I turned my attention to getting us into the inlet. 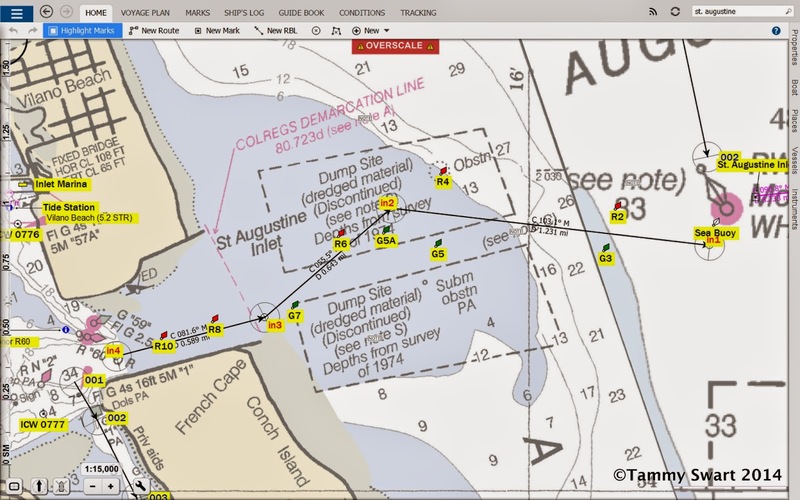 We had been hearing the USCG’s Notice to Mariners report of three missing markers… There is a lot of information out there and none of it says that the St. Augustine inlet is a piece of cake… But with information from Towboat Us, Active Captain, and our friends Mark and Diana Doyle, who graciously provided us with their latest soundings (albeit several months old) of the inlet, we thought we would give it a go. When we were within cell/data range I checked out what had been happening on my FaceBook page and found a barrage of warnings about a 44 ft sailboat that had ended up on the beach the day before when trying to come into the inlet. I tried contacting those who had posted but in the end, called Towboat US for a confirmation. I spoke to Justin Daily who was very nice. He had come through the inlet the prior evening and gave me his advice. We were feeling a healthy nervousness but were OK about it. We had arrived, born by a swift incoming tidal current, to our planned anchorage just before the Bridge of Lions. We picked our spot and had the anchor down in minutes. WOW! What a time we had. We enjoyed the flood of feelings as our success washed over us until it was replaced by fatigue. Bruce had a beer and a nap, but I was too keyed up to sleep. Pirate ship preparing to attack! I sat in the cockpit with all of the flaps open and enjoyed the VHF chatter and the parade of boats and bridge openings before me. There was a pirate attack right out in front of the old fort and I watched in delight as the small boat gave chase, circled the larger boat and was finally defeated amidst puffs of smoke from cannon fire. Boom De Yada's triumphant arrival! Just before we got the anchor down earlier, our friends on BoomDeYada made contact on the VHF. They had resolved their fuel issues and were just behind us. I shared my inlet notes with them and was there to snap pictures of their arrival at the bridge. I was SO happy to see that they had made it here instead of being forced to abort and make landfall at some inlet further north. Bruce, rejuvenated by his nap, joined me in the cockpit and we watched the day end, embracing the coming of this night. He grilled some fine pork chops to go with our veggie leftovers from our thanksgiving meal and we greeted our old friends from our Clearwater Beach days almost a year ago, Stephanie Dawn. We are so thankful and happy to be here again. On our way south again. In St. Augustine again… And most of all, out of the COLD again!